Summer’s BLTs melt into autumn’s grilled cheese. 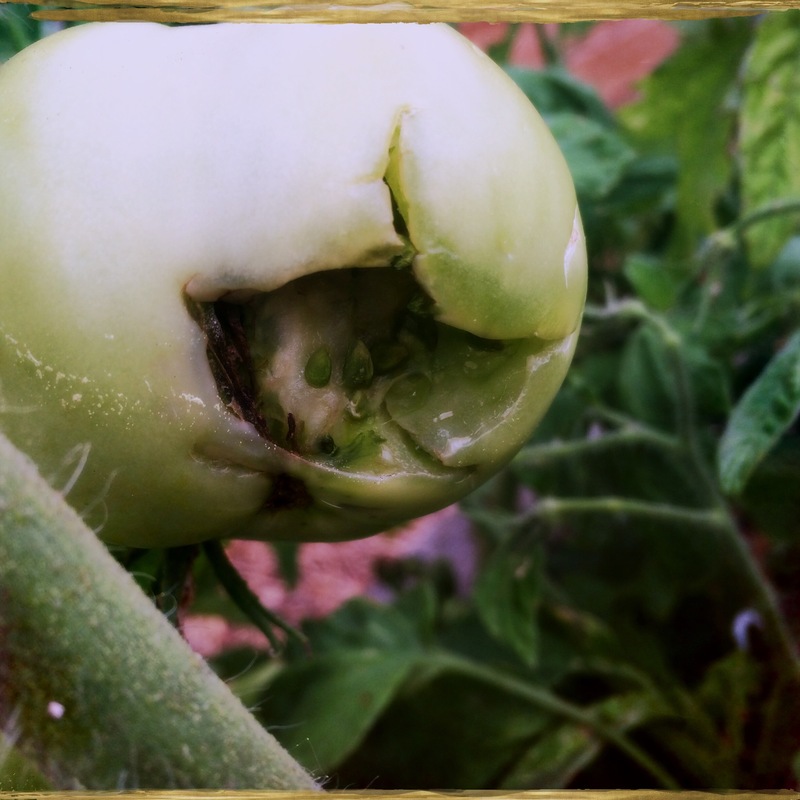 One tomato left! I’ve come to cherish my garden peppers: shishitos, paprika, jalapeño. I’ve grown peppers before because they’re gratifying; easy to start, often prolific, but I haven’t really loved them until this summer. After a couple decades living in the southwest, I finally sometimes crave a bit of heat in my food; I’ve made friends with the jalapeño. This summer I picked up a jalapeño seedling from Zephyros Farm, and started a dozen shishitos, some of which I traded for 3 Leutschauer paprika peppers that the Bad Dogs started. The jalapeño I planted in a patio pot, and it gave me dozens and dozens of bright green peppers through the summer. Grasshoppers hammered its foliage but that seemed to spur it to greater production. I froze three batches of chopped jalapeños in oil in an ice tray, then popped the cubes into freezer bags for cooking. After chopping the first batch without gloves, my fingertips caught fire. Since drinking milk helps with mouth burn, I thought, I soaked them in a splash of cold cream. It did help. And the plant continues to flower and fruit; before the big freeze I brought it into the sunroom, and it’s got half a dozen new peppers already. … or solo. Just a small batch flash-fried (blistered) in olive oil in a hot skillet, then sprinkled with fresh-ground salt, and served with an adult beverage. I nurtured those little shishito peppers from seeds in a salad box, lovingly watching over their sprouting and first leaves, potting them up, bringing them in every night for weeks, waiting til late June to put them in the raised bed, wrapping them first with walls-o-water, then covering with row cloth. And finally, with trepidation because of the grasshopper infestation, opening their cover to give them full sun. They thrived. I planted the paprika peppers at the south end of the same bed. They grew almost two feet tall and were covered in fruit which never ripened. I read somewhere that this particular Leutschauer variety ripened to a bright red by the end of August in Ontario, and made the mistake of assuming a shorter season than they actually require. At our altitude, with nights consistently in the 40s by September keeping the soil wet and cold, these peppers will need to be started much earlier next year; I’ll also plant them in pots so I can bring them inside to finish if need be. Apparently nights should remain above 50 for them to turn scarlet. 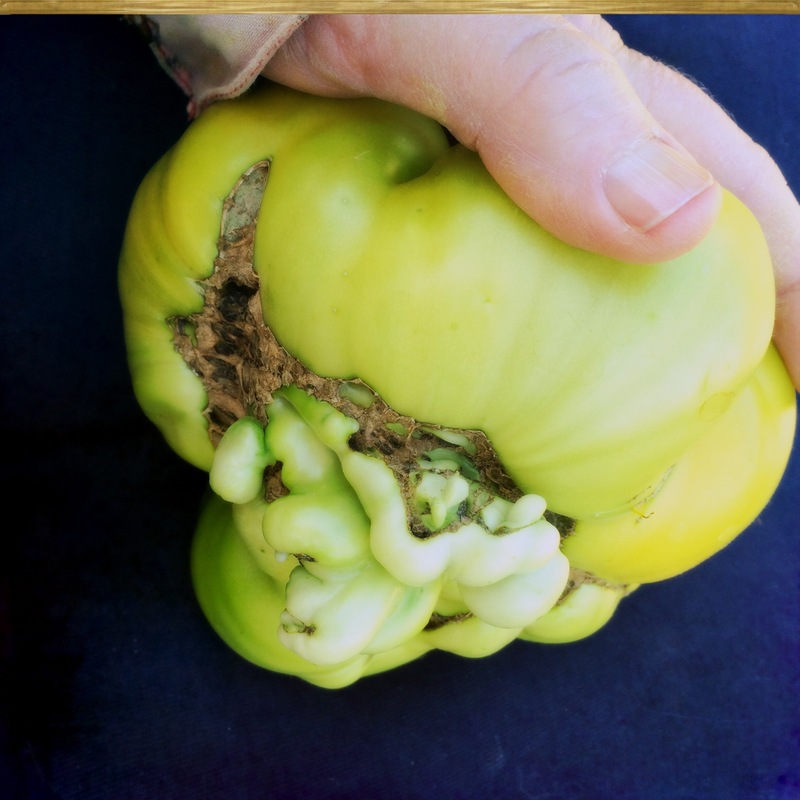 The evening before the first deep freeze, I picked a huge bowl of green peppers, taking nearly all the fruits in hopes they’d ripen off the stalk. Only a couple of them turned red. Most remained green, even those with blackened shoulders. Baker Creek support suggested I could try drying them anyway to make paprika powder. The first batch I roasted at 350 for about twenty minutes, turning a few times, then turned the oven down to 200 and dried them for about five hours. After they cooled, I tried to powder them in the food processor, but that didn’t work. The blender did; I pulsed them, then sifted, then pulsed a few times, and made about a quarter cup of paprika powder. Seemed like an awful lot of trouble for what I got, until I tasted it. Attempting to improve the result, I roasted the next batch at 400 for about 12 minutes, took them out and let the oven cool to 200, and cut out the seed cores before drying the peppers. It took only slightly less time for them to dry, though they were bigger peppers. For the amount of paprika I use in a year, I got plenty, with a decidedly richer flavor than store-bought. Two batches of paprika from a summer’s worth of water, TLC, and three pepper plants. Hmmm. 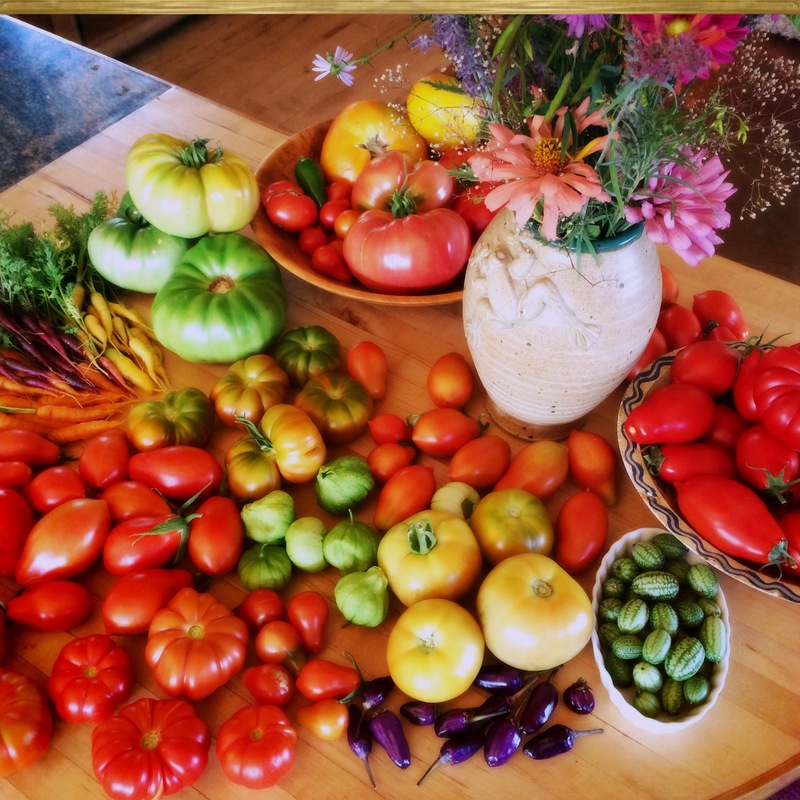 My kitchen counter at the height of harvest season…. 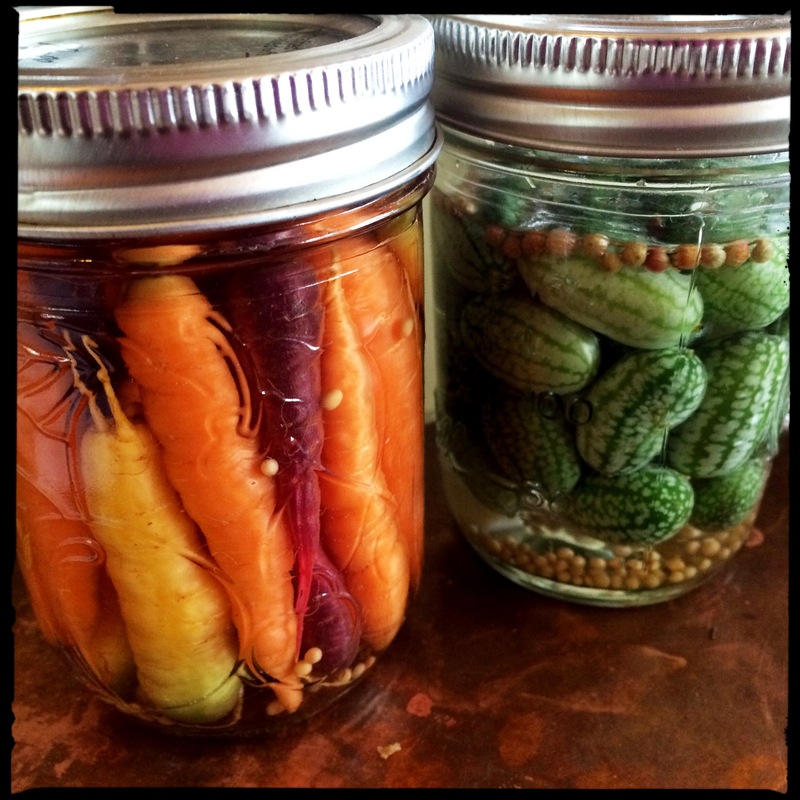 and below, after preserving. Green tomato pickles, roasted green tomato salsa, regular red salsa, paprika, and two types of tomato sauce, with a few stragglers in a bowl. Counting the bags of sauce in the freezer, I can have some kind of homegrown tomato treat almost every week til the next crop comes in! Driving around the valley the past couple of weeks has been spectacular, and achingly poignant. 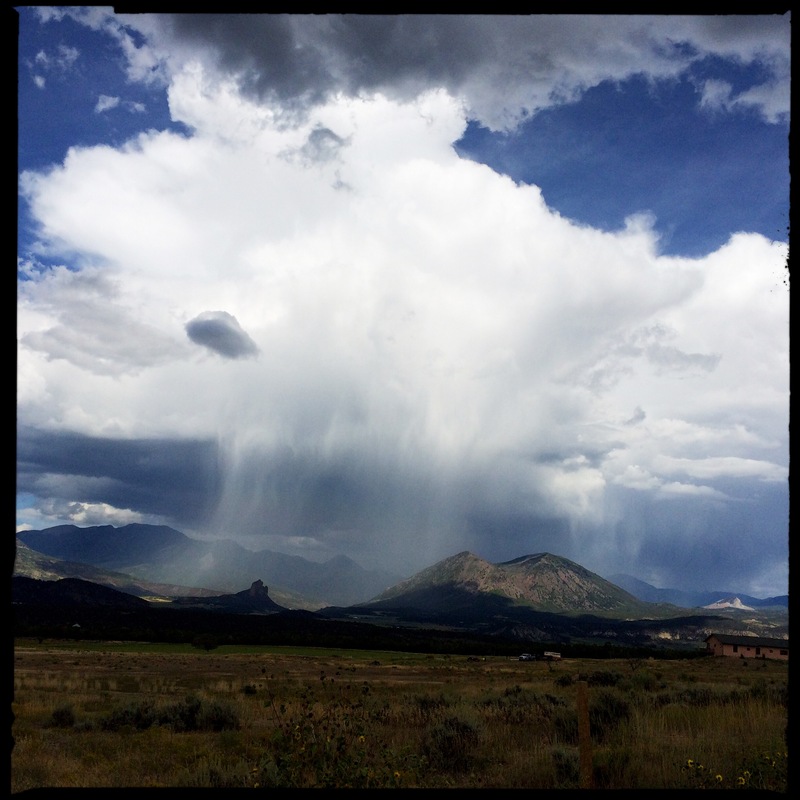 On the way to town the other day, against a backdrop of dark grey raining clouds, the slopes of Saddle Mountain emerged in sunshine a rainbow themselves, yellow and green aspen, orange oak, blue and purple shadows down juniper green hills. The road down Rodstrom Grade its own cascade of colors, sandstone cliffs frothing with wild clematis seedheads, spent blossoms of rabbit brush lining the road; russet, orange, red serviceberry, squawbush and apricot trees, cottonwoods turning the canyon gold, chartreuse and yellow. Always a chance on this road of bobcat, coyote, lion or bear. I turn on and off the radio as I drive. In just the past month, this country, this world, has changed so much, multifarious threats escalating. I tune in and out of the “news” a dozen times a day, tracking the next climate chaos disaster: hurricanes, wildfires, famines, human migrations; shuddering at the latest lies and doublespeak from the current regime; weeping at the most recent man-made tragedy; gauging the latest threat of nuclear war. Like the proverbial frog in a pot of water, we unwittingly adapt to climbing tensions that will ultimately boil us alive; we are crashing toward some unforeseen finale. We might consider ourselves lucky if the Yellowstone supervolcano blows before our democracy does. Driving home from town, a view never before seen, never this exact amalgamation of earth forms, rain light, autumn palette: Fresh snow on the north end of Mendicant Ridge as mist rises, exposing sunlit slopes through the shadowed gap between Saddle Mountain Lands End. Heavy grey rick-rack clouds lift to reveal a window deep into the West Elk mountains: caught in a beam of sunlight, silhouettes of ranges recede into lighter deeper blues and greys, pale rain falling lightly over layers of gold and deep green aspen-fir slopes. Exquisite wild world, each moment unique. This is what’s real. This precious watershed, a pawn in the battle for our public lands, our lives and livelihoods that depend on the clean water, clear air, and healthy soil that provide the foods that sustain us. I pack the pantry and the freezer with peppers and tomatoes, and cherish each hazy day. The yard begins to give in to winter. About a quarter of the almonds from the tree this year, blanched, half of those peeled and half waiting. A bit unsettled still this morning, or again, after another anxiety dream woke me too early. Ever since I almost killed the cat last week my general anxiety level, which had subsided nicely for awhile, has ratcheted up. I guess the political climate and the potential for fracking in our mountains have also exacerbated it. But the dreams all involve me failing to notice something urgent. Anyway, after taking Ojo in for more subcutaneous fluids this morning I returned and grabbed a bag of frozen almonds out of the freezer. I needed room for some bread, and it suddenly seemed like a meditative food task was in order to calm my mind. As I cracked and shelled them I let my hands do all the thinking, how best to get each one out of its unique shell: some of them cracking sharply, slip a thumbnail in the crack and pop them apart; some crumbly, requiring fussing. I tasted a few along the way, made sure I didn’t drop any. Some were fat and light-colored and mostly tasted sweet, some were wrinkly and dark and tasted bitter. I poured boiling water over the bowl to blanch them, and tried to slip the skins off after two minutes. My almonds were small, and either unripe or a little dried out, I don’t know which. Had I picked them too early? Or let them stay too long on the tree? Another two-minute blanch, and most of the skins were coming off easily, mostly from the plump, lighter almonds. The darker nuts did not want to peel. A few popped right out of my fingers and flew off or across the counter. Those I caught, rinsed if they’d hit the floor, and ate. Even without the skins, the pattern held; most of the darker nuts were bitter, and also some of the lighter ones. I quit peeling the dark nuts. Old or unripe, either way they weren’t worth the trouble. I’ll look this up when I finish this batch, I thought. When are almonds bitter? Are unripe almonds bitter? I phrased the search question a few ways as I kept popping almonds from their skins. Hmmm. I wonder if bitter almonds are bad for you? And then, slowly, a dark thought unwound itself in my throat. Are almonds toxic to CATS? But first I looked up the bitter almond question, and was dismayed to find that there are two varieties of almond trees, sweet (Prunus dulsis var. dulsis) and bitter (P dulsis var. amara). Bitter almonds are used in almond extract, but can otherwise be toxic. From Wikipedia: Bitter almonds may yield from 4–9 mg of hydrogen cyanide per almond and contain 42 times higher amounts of cyanide than the trace levels found in sweet almonds. All commercially grown almonds sold as food in the United States are of the “sweet” variety. The US Food and Drug Administration reported in 2010 that some fractions of imported sweet almonds were contaminated with bitter almonds. Eating such almonds could result in vertigo and other typical bitter almond (cyanide) poisoning effects. Oh great. Did I happen to get one of those rare bitter almonds that contaminate the sweet trees? And if they could give me vertigo, what could they do to my cat with the compromised kidneys? Extract of bitter almond was once used medicinally but even in small doses, effects are severe or lethal, especially in children; the cyanide must be removed before consumption. The acute oral lethal dose of cyanide for adult humans is reported to be 0.5–3.5 mg/kg of body weight (approximately 50 bitter almonds), whereas for children, consuming 5–10 bitter almonds may be fatal. Well, there’s a kernel of hope in that paragraph; maybe I can process my almonds, that I was so proud to harvest, and spent so many hours hulling and drying and shelling and peeling, and remove the cyanide, just in case there’s actually a toxic amount in them. Really, a disappointing percentage of them taste bitter, maybe just a little bitter, but still. How hard could it be to remove the cyanide? Reducing the hydrogen cyanide requires crushing the seeds, drying the crushed seed powder into a cake, soaking it in water to break it up and then distilling the product. Yet, just 7.5 milliliters of bitter almond oil has resulted in death. I’m thinking now that I’ll make a little more room in the freezer. It would be a shame to throw them out, but I could compost them, salvage something at least from my exciting almond harvest. Or could I? What if the cat, or that crazy catahoula, gets in the compost? What if one of them eats an almond off the ground under the tree, where the late splitters are falling one by one? It is so hard to be as vigilant as I am. How do I balance my brand new anxiety about almonds with my attachments? To the homesteader ideal that caused me to plant the tree in the first place, to all the work I’ve done so far and the prospect of enjoying my homegrown almonds toasted, roasted, slivered, as snacks and garnishes, through the winter; above all to the little compromised kitty? It may not matter. I’ve eaten about twenty of them this morning. Wikipedia says a lethal dose for an adult is 50 almonds. Another site says “eating 20 of these almonds raw is lethal for adults.” We’ll know more later! Wow, almonds sure are labor intensive. Here’s the morning’s project a couple of hours after starting with the frozen almonds in the shell. And now, perhaps, all for naught. … and I got a big bowl full from the Fuji. I’ll be honest, I have a fraught relationship with apples. At one point I decided they’re more trouble than they’re worth. If you don’t at least slice them, or better yet peel then slice them, and you just eat one out of your hand: you have to bite hard, chew a lot, and the skin inevitably slides up between my teeth and gets stuck, sometimes even slicing my gum. One day I embarked upon a quest to find an apple that was worth the trouble. After many months of many tastings, I did find one. It became clear that for me the only apple worth eating off the tree is a Fuji. So I bought a tree. And now, that little tree that has struggled with not the best placement, with insufficient protection from deer year after year, with frost at just the wrong time, that little tree by my front gate is feeding me plenty of apples worth eating right off the tree. Pamela loaned us this amazing gadget that peels, cores and slices all in one! Apples will never be too much trouble again! Meanwhile, the almond tree, who I knew would let me know when it was ready to let go, has let me know. Half the tree in a big wooden bowl, the other half so high I’ll need to pick them from the deck or knock them down, my vision for this tree finally come to fruition. Almonds, broken open or nearly so, losing their green, taking on autumnal hue. Inside leathery fruit already drying in desert winds lies an almond in the shell, some of these already consenting to crack. Inside the tawny shell not quite set, a milky tan or brown-skinned gem… Bitter. Those with the brown skins are bitter, and even some of the skinless ones a little bitter. 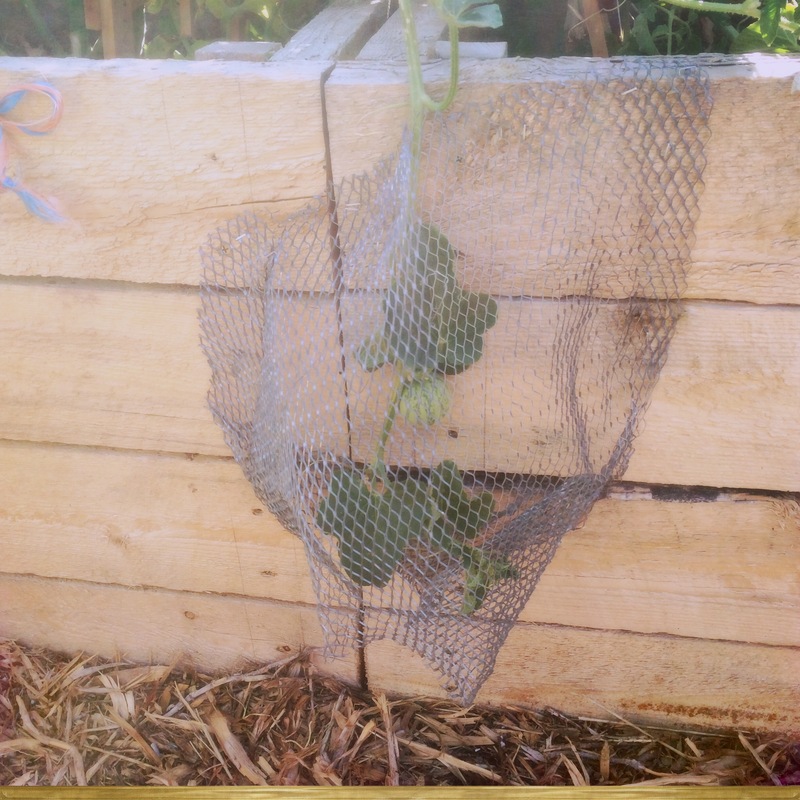 They will benefit from blanching. After husking I lay the nuts out to dry in their shells, and will freeze them shelled or unshelled when I can hear most of them rattle in the shell. Rose hips almost ripe and ready to be turned into jelly. How many frogs? Through benign neglect of my fish ponds they’ve become frog ponds. I counted a total of seventeen northern leopard frogs in both ponds at once this afternoon, an all-time record. Two color morphs of the leopard frog, brown and green, communing at the edge of the pond. Each summer for the past few years I’ve seen a few more frogs. At least in this hazardous world where amphibians are declining at an astonishing rate, my little pond has become a haven for this wonderful native species. These next few weeks create our future, in so many ways. Will we make it be the one we want to see? A future honoring our planet, mother nature, our atmosphere, father sky, brother sun, sister moon? 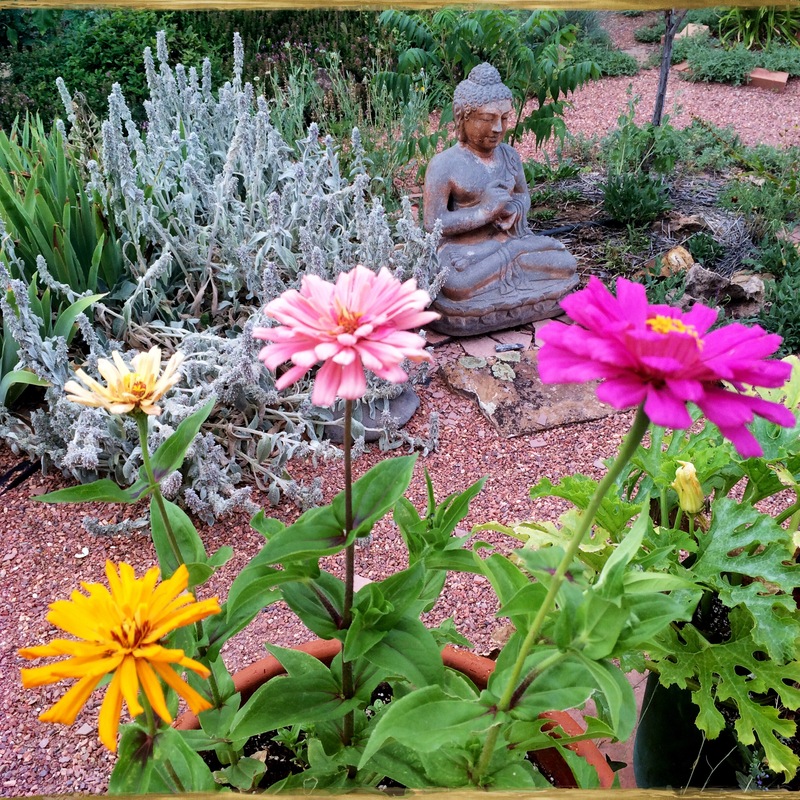 Will we choose reverence for life in a meaningful way before it’s too late? We don’t often have a concatenation of events that provides us with as much opportunity to influence our future as we have in the next four to six weeks; right now, we have two such opportunities, one on a local level and the other on a global level. We are in a bardo now between great potential for harm and great potential for slamming on the brakes to slow the decimation of Earth. Until November 1, we have a window to make our voices heard and direct the policy guiding the public lands that surround our valley for the next two to three decades. This is not another one-time fight. What’s at stake this time is the Resource Management Plan (RMP) that will direct the use of public lands surrounding and within our valley for the next 20-30 years. We have a singular opportunity with this RMP. Let’s flood the Bureau of Land Management with ten times as many letters as we sent last time, four years ago, when this fight was for a one-time lease sale. Let’s send ten thousand letters, twenty thousand, thirty thousand. We have the chance to say now, in the policy that’s set for the next two generations: NO! Our local conservation groups have made it so easy to submit comments. The cogent letter is written for you. Fill in a few blanks, add any personal comments, and mail or email your letter today. You can submit as many comments as you like; unlike voting, you’re not limited to one. And you don’t have to live here to take a stand. Please share and share this plea and these links to help save the organic foods capital of Colorado. Though the industry strives to convince us otherwise, there’s a lot of indisputable evidence that fracking fluids are toxic to life, human and otherwise, that the effects of drilling and wastewater injection can spread far from the site, that spills devastate land and water, that transport by pipeline, train or truck can cause massive explosions. The list of deleterious effects goes on and on, from air pollution and habitat destruction (human and other) to induced earthquakes. According to the USGS, induced earthquakes have risen dramatically in the past five years as a result of drilling activities in states including Ohio, Texas, Oklahoma, and Colorado. We need to stake our claim to our public lands, our air, our watersheds, and not let them be exploited for profit by a few powerful corporations. We must protect all that is essential to our lives: The sights and sounds and experiences that make life here so precious, the food, the water, the soils that nurture not just human health but whole ecosystem health. We must speak now, loud and clear, spread the word, and enlist the voices of all our neighbors, of our friends and families far and wide, of anyone who has ever lived here or hopes to, of anyone who has ever enjoyed visiting this valley or hopes to, of anyone who enjoys the fruits and meats and wines of this valley. We can make change if we undertake it at the right time, not so much when the stars align as when good intentions and political schedules coincide; in these few transformational moments what we say and do can actually make a difference. This is the time to make our choices, raise our voices in a way that counts. This is not the time to be resigned. Apricots showed up in many festive meals last month, including these appetizers: perfect apricots cut in half, pits replaced with a dollop of softened cream cheese and topped with salted, roasted almonds. Another place they showed up was this leg-of-goat roast at the Bad Dog Ranch, in the glaze and in a pan-cooked chutney alongside, courtesy of Chef Gabrielle. After making apricot jam, harvesting the garden and raiding the fridge, time for a gin gimlet and fresh vegetable curry over red rice, inspired by a friend’s recipe. …add zucchini and yellow squash and handfuls of fresh purple and green basil, and simmer til soft and yummy, then serve over rice. The BLT is another kind of sandwich altogether, not a tomato sandwich. Sometimes you feel like bacon, sometimes you don’t. But thick bacon! How do you make a BLT with thick bacon? It is just too chewy to bite into pieces. I tried first with chunks of thick bacon instead of whole strips. And finally solved the dilemma after cooking chopped thick bacon for a pasta sauce. Chop the bacon small and fry til crispy, then add to the sandwich. Carrots were ready at last. Not a great harvest, but a lot better than last year. They loved the raised bed with its loamy loose soil, but the grasshoppers got their tops through much of the summer. Mostly good-sized roots, and lots of gorgeous colors. 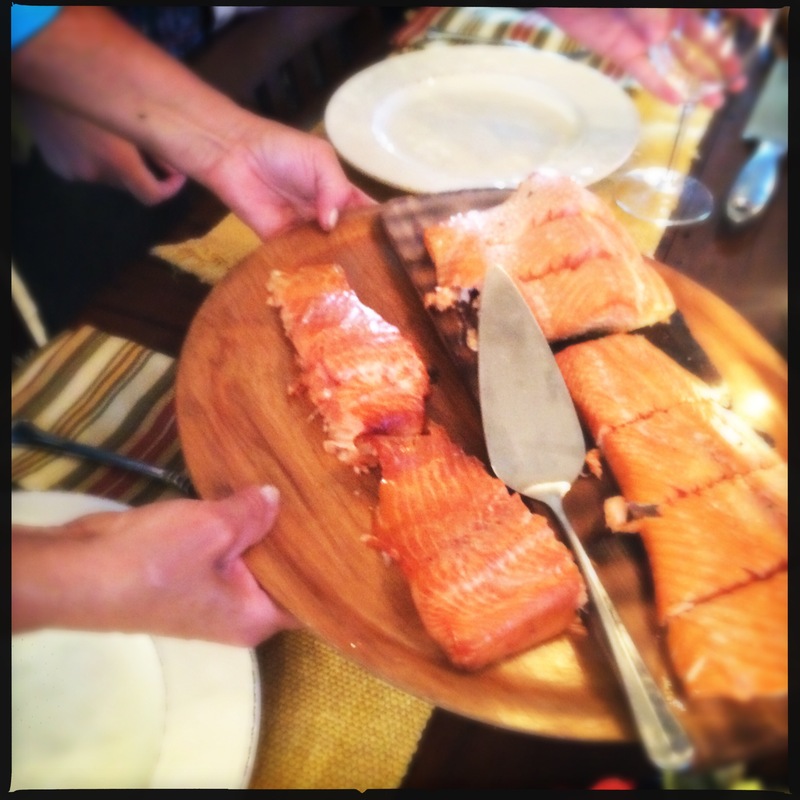 One of the many things I love the most about living in the North Fork Valley is the food we share. 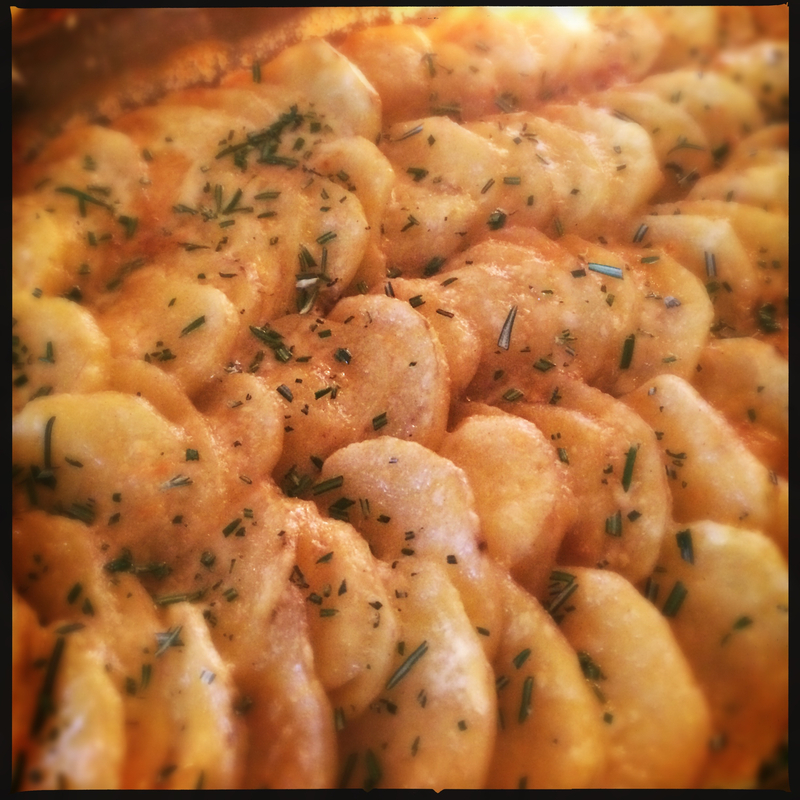 We share it in gourmet or casual potlucks, dinner parties, and by the bag, box and basket. 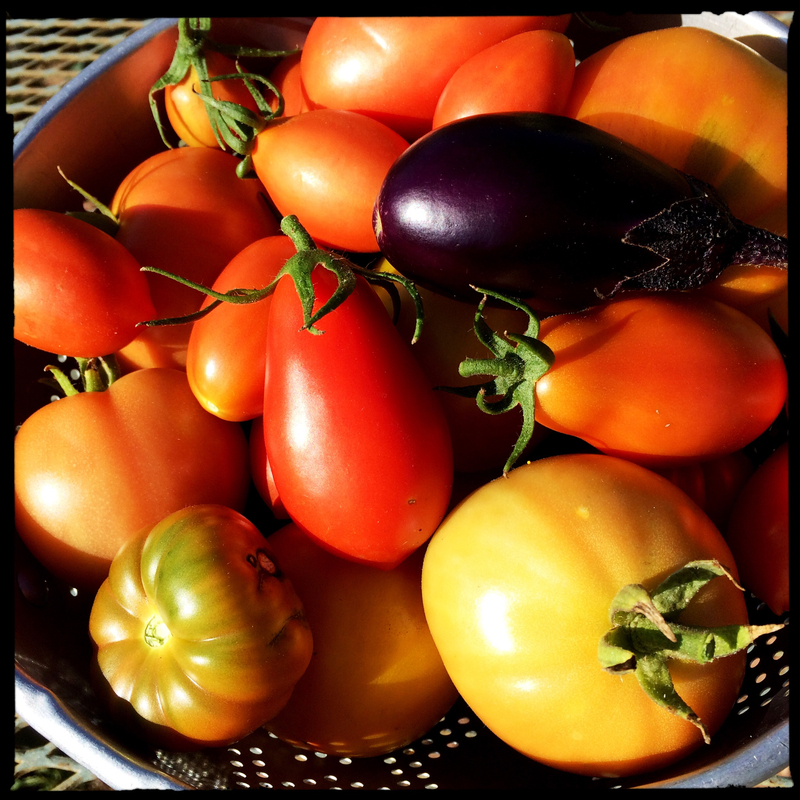 These perfect tomatoes came from Mary’s kitchen in exchange for a box of plums picked off of Ellie’s tree. We are blessed with a climate that in some years gives us outrageous amounts of fresh fruit, and in most years gives us gems like these. Our valley is the Organic capital of Colorado, and our produce shows up around the state in all the best Farmers’ Markets. We have the opportunity in the next 56 days to influence the policy that will determine the level of industrial extraction in the wild public lands that surround our valley; those hills and mountains that comprise our watersheds, our views, our recreation, and our thriving and growing economy based on producing the highest quality vegetables, meats, wines, and recreational opportunities. Hunters, fisher-folk, tourists, people who buy the North Fork Valley’s food products around the state and country, anyone who has ever visited this valley or would like to, we need your support. You can start here. More to come. 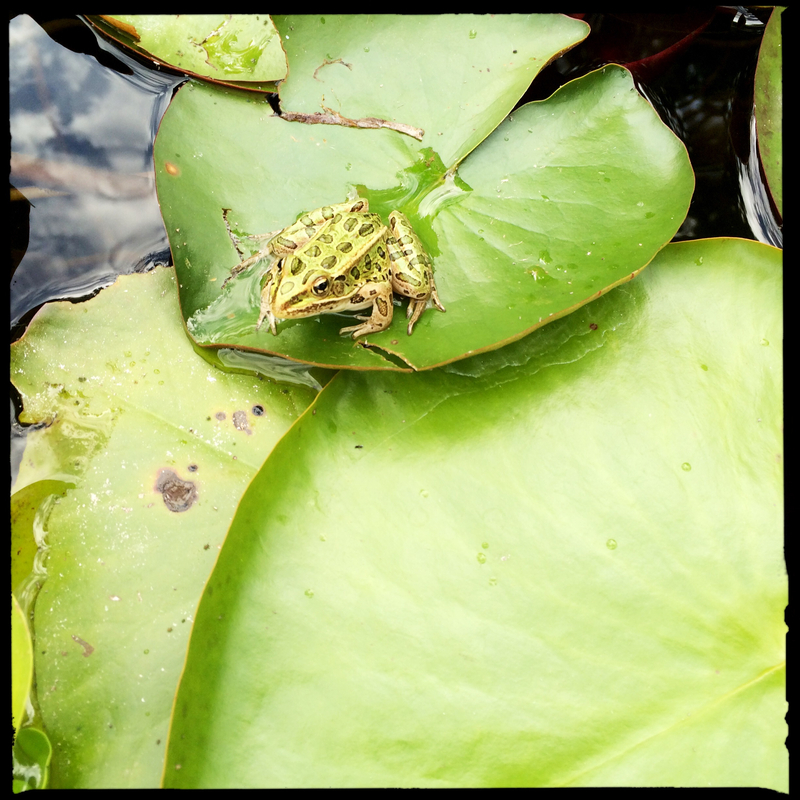 All the frog activity this spring has resulted in a delightful crop of baby leopard frogs hopping all about the pond for the past month. 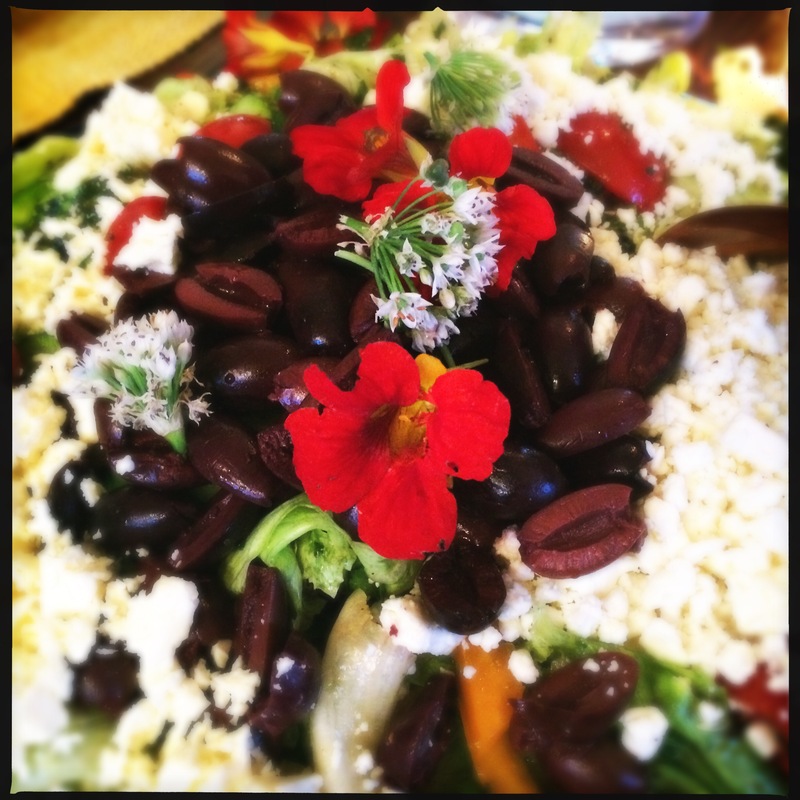 A whirlwind of work, company, and gardening has blown away the last half of summer; a delirium of fresh food has filled the days and evenings. Every day for the past month I’ve happily harvested something from the garden, filling bellies and freezers. I’ve gotten into a nice, nurturing routine with the tomatoes, picking a few every morning, then making a sauce once a week or so with the Novas and Costoluto Genovese, enough to eat some and freeze some. And enjoying the cherry-pears and various slicers in scrambletts, sandwiches, and salads. 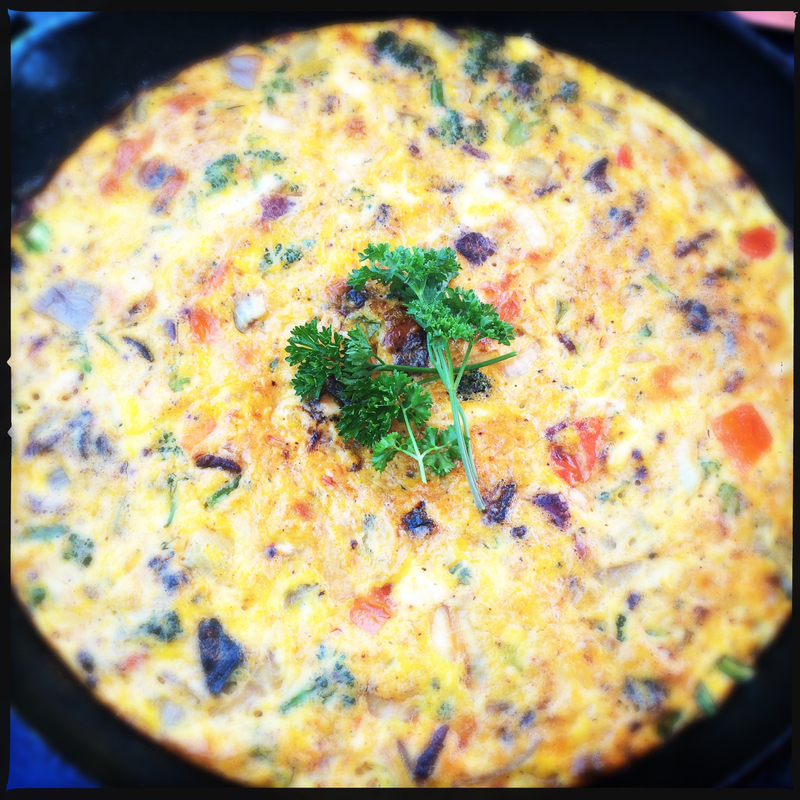 Also frittatas, with Pamela eggs, Stout bacon, and everything else from the garden. 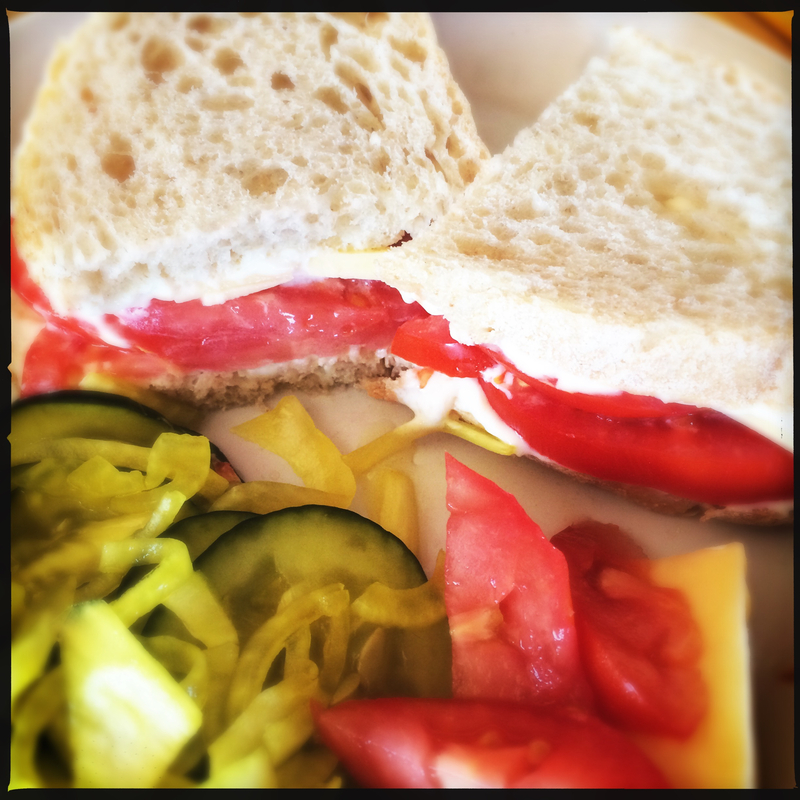 The first tomato sandwich, with bread and butter refrigerator pickles I made with cukes from a neighbor’s garden. 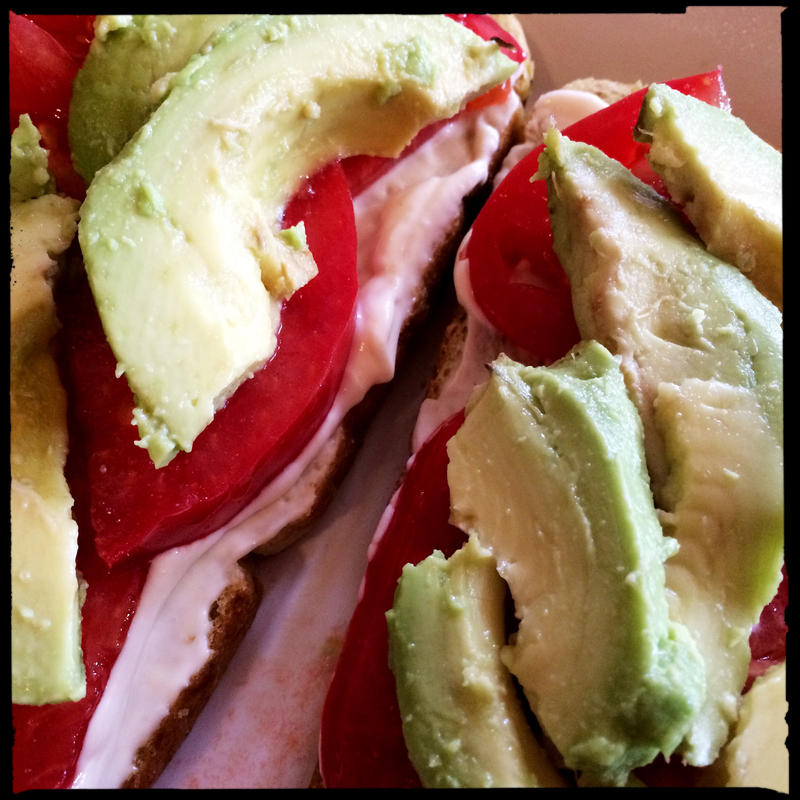 Tomato avocado open-faced sandwich on sun-dried tomato/spinach bread from the Flying Fork Bakery. Yum. 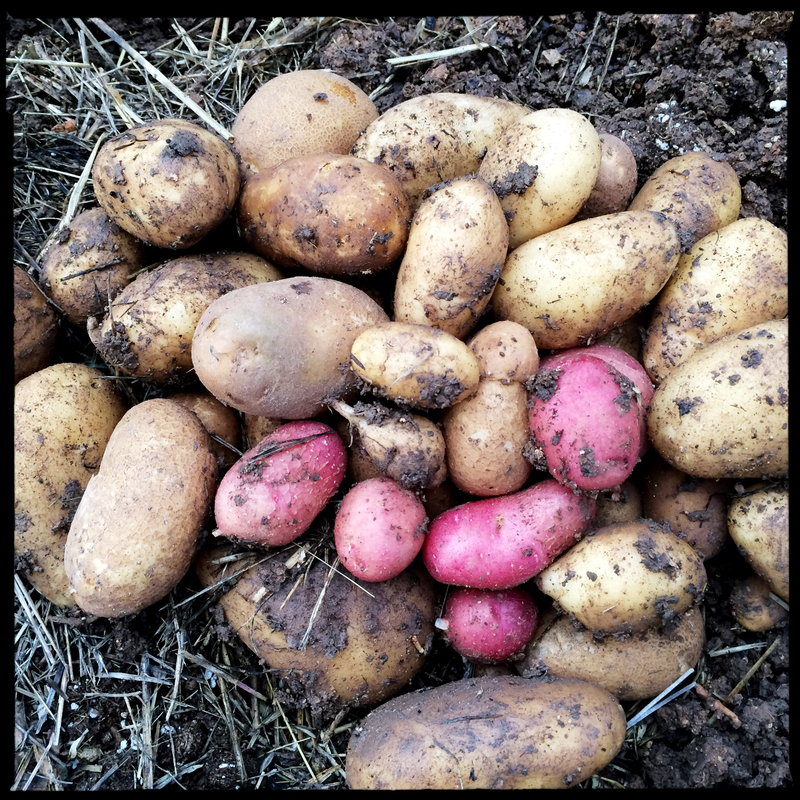 Potatoes went in late and spontaneously this spring, in a clayey bed; I just cut up some organic grocery store potatoes that were past their prime and stuck them in the ground. Despite all the spring rain compacting the soil, and me never seeing the tragic-looking plants flower, the Potato’s drive to reproduce gave me a decent little harvest. 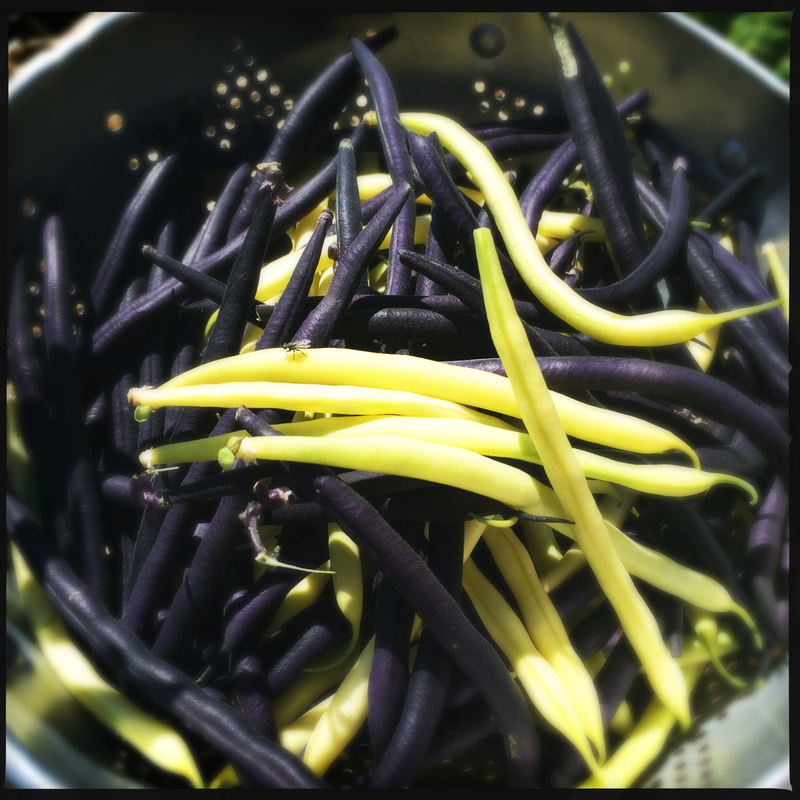 Purple velour and golden filet beans planted together in the raised bed gave up beans of both colors for months, providing lots of delicious marinated snacks and several bags for freezing. 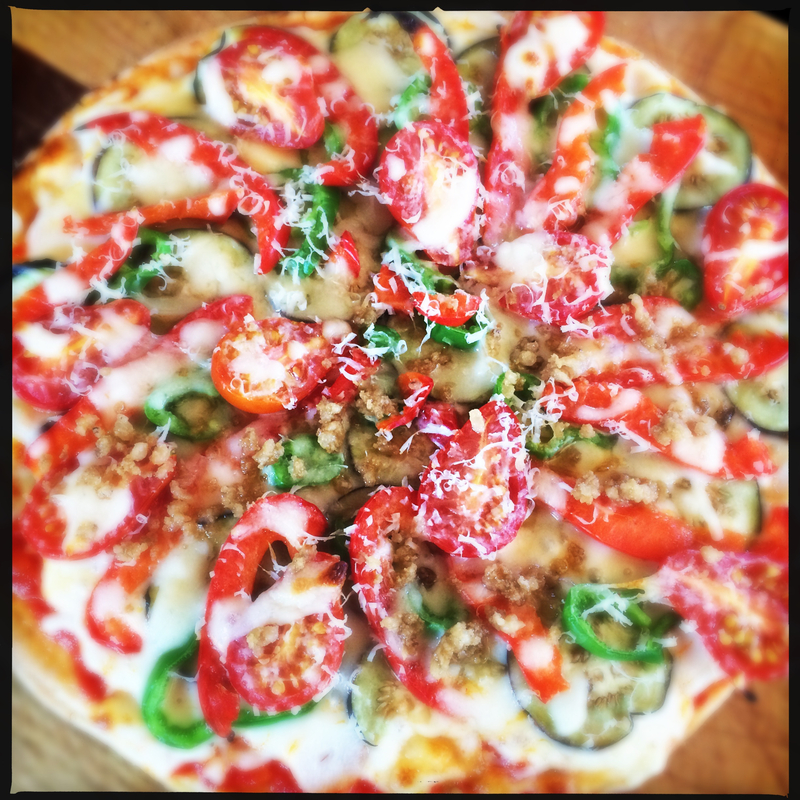 … and a treat from their huge Yukon gold harvest, cheesy goodness. 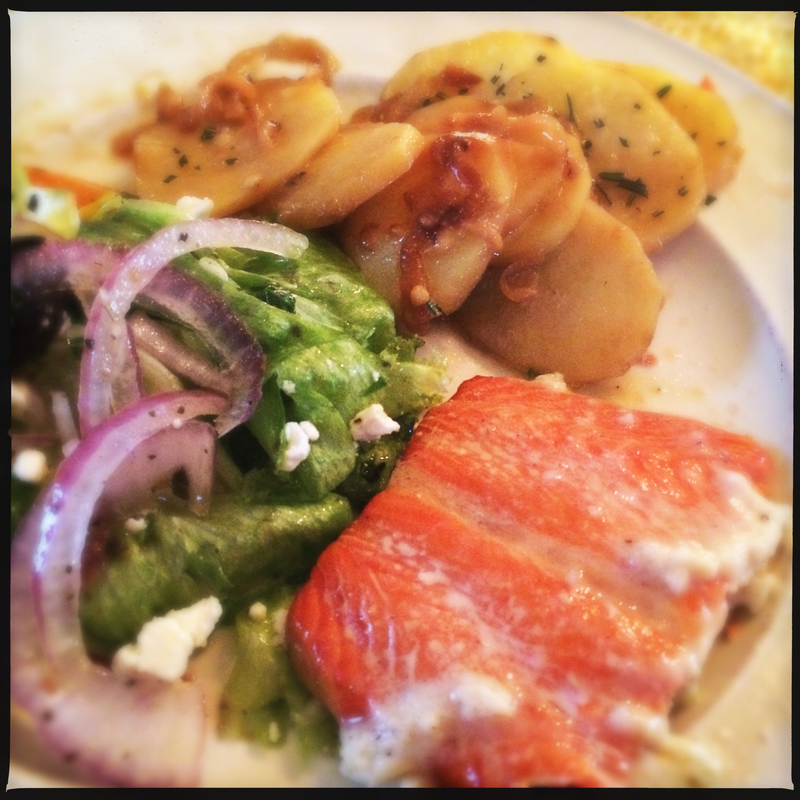 … for just another spectacular summer family dinner. 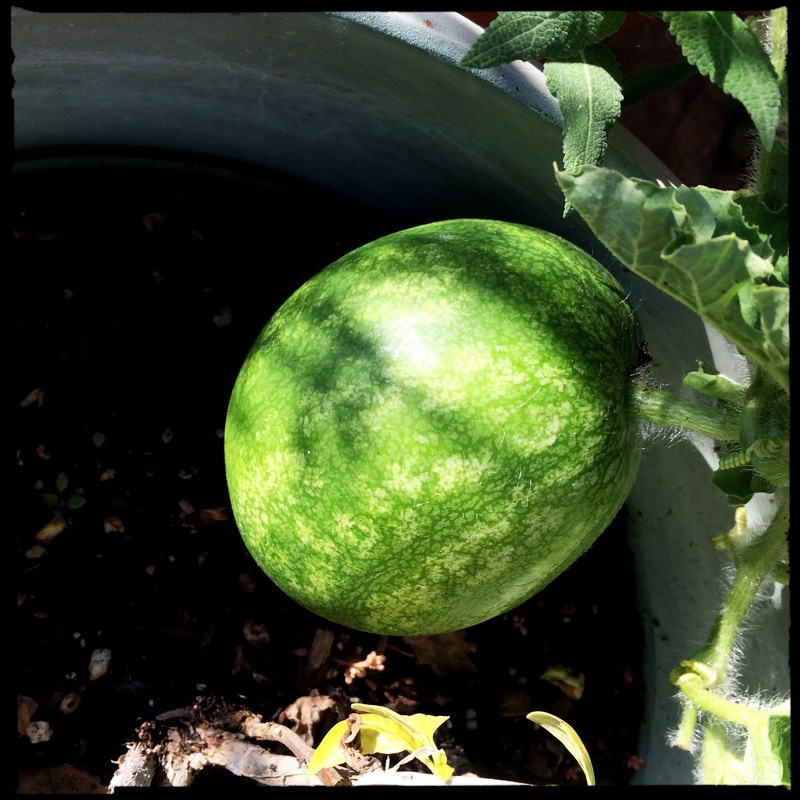 After losing so many little melons I was thrilled a few weeks ago to spot this little Tigger melon, so I used some old lathe to protect it! 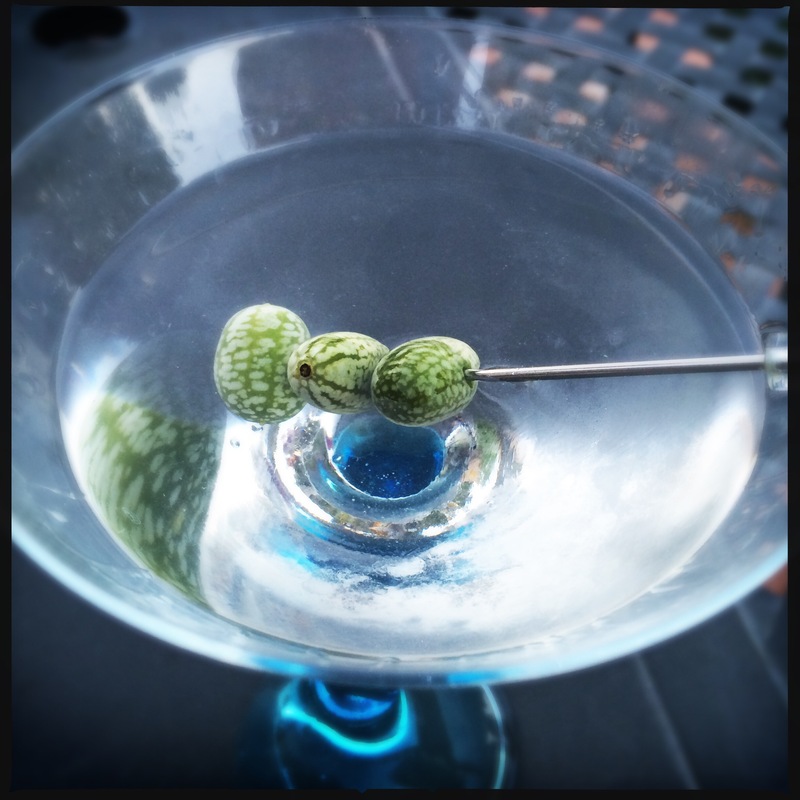 … for a great martini garnish! 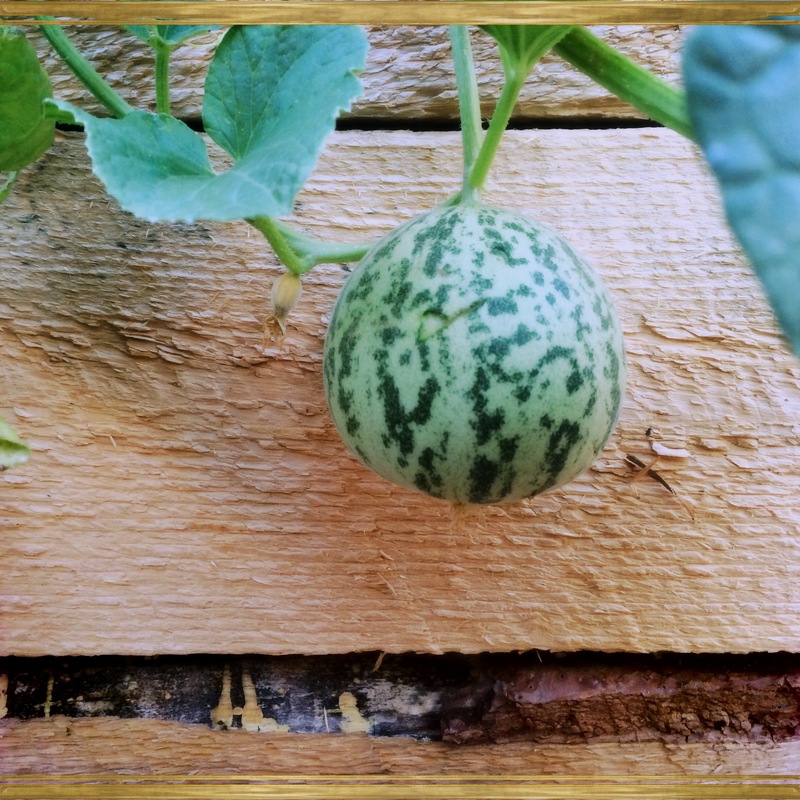 … and an undiscovered Alvaro melon off the edge of the raised bed. 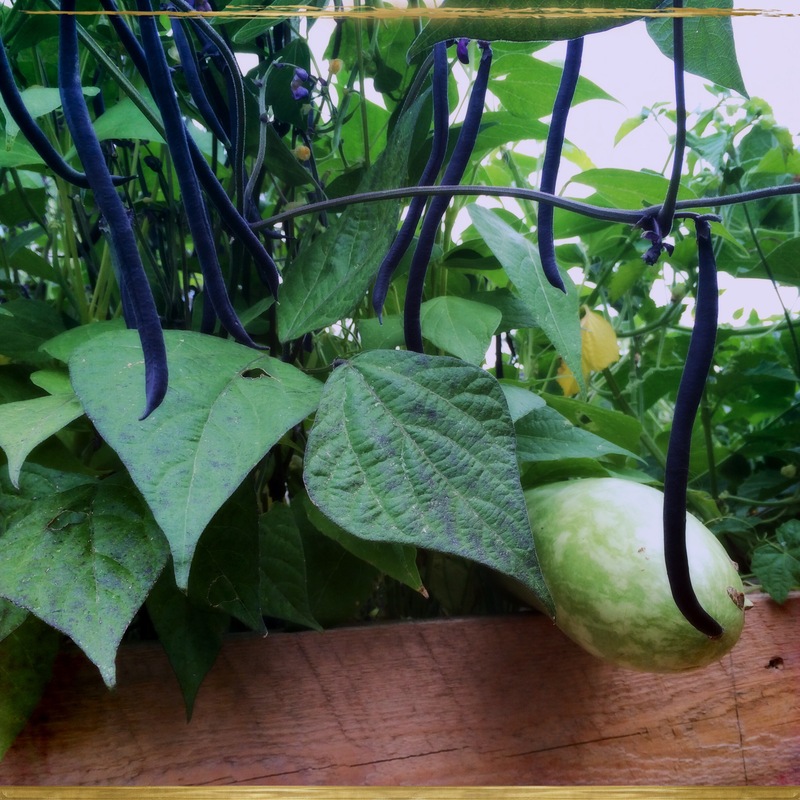 Fingers crossed these get to ripen before the rodents get them. Monsoonal flow continued through August and into early September; only just now are we getting a stretch of warm summer days without rain. 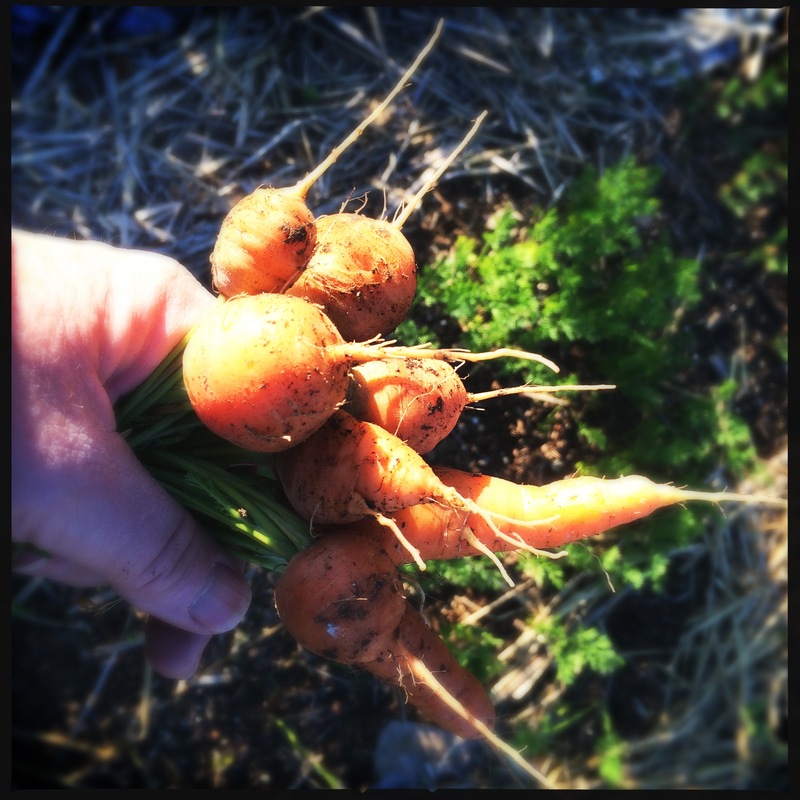 Carrots leftover in the ground from last fall, the little round French ones, and a couple of small Chantenays. 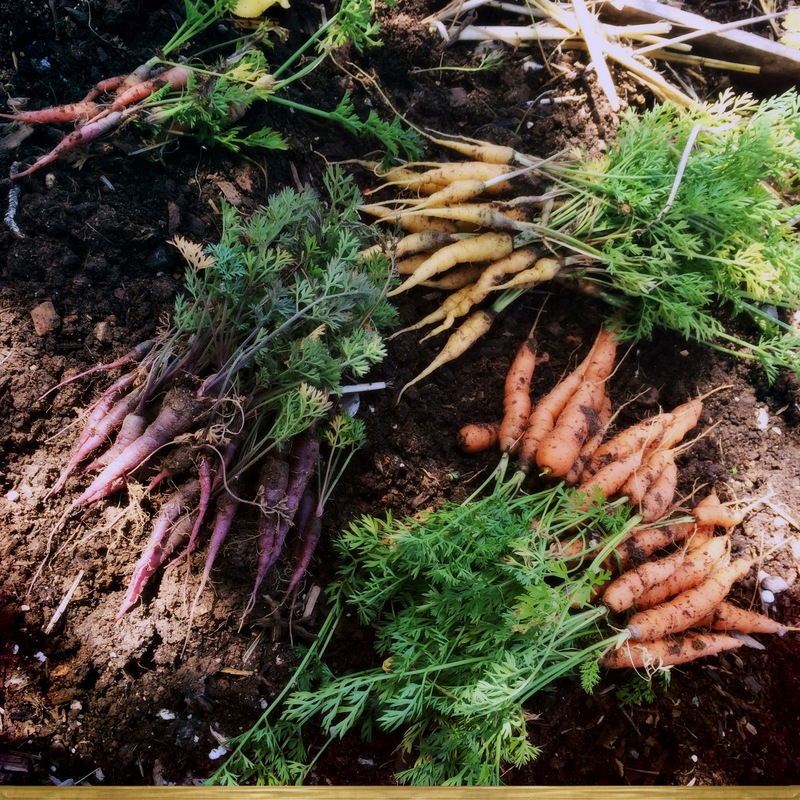 The new carrots have not done well at all because of all the spring rain compacting the clay soil. 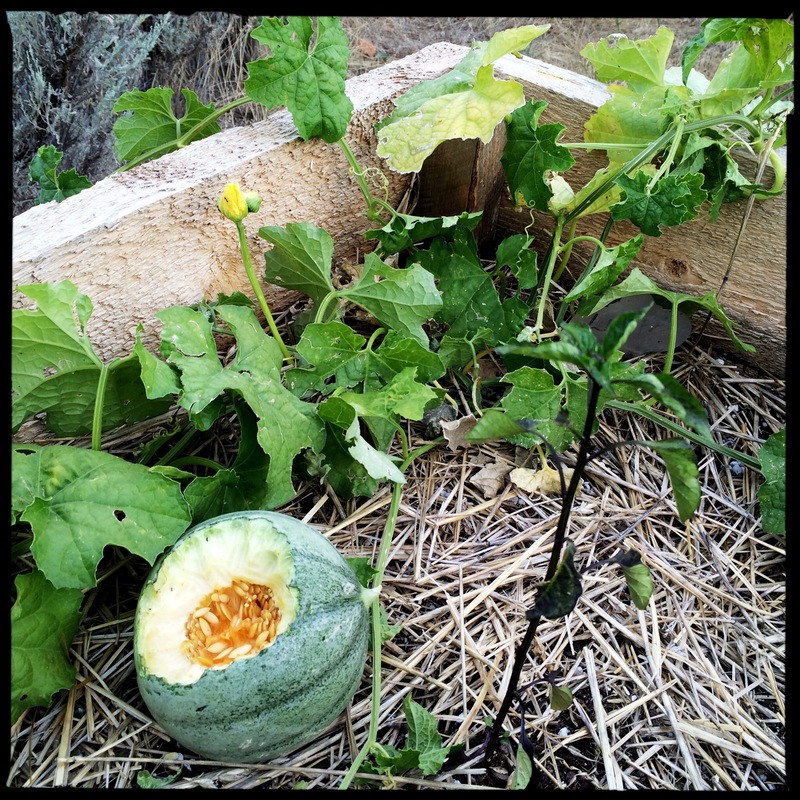 A few fruits and vegetables are finally ripening in this weird summer weather. And as many are being ravaged by beasts. 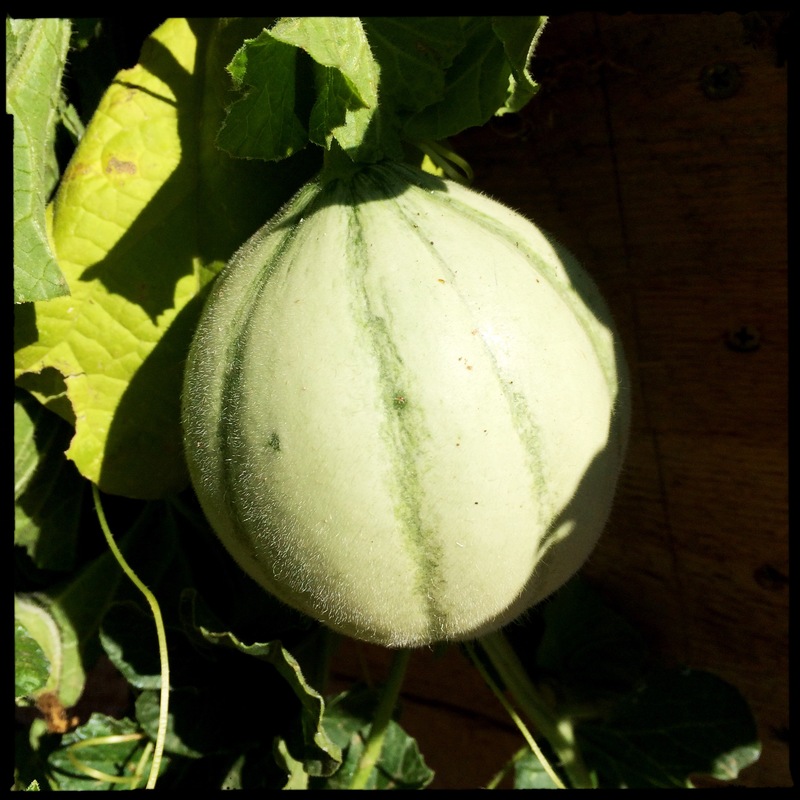 A sweet surprise yesterday morning, our first Tigger melon! Who did this to my perfect Alvaro melon? And scratched up the other one? It’s as though a raccoon walked through here. I’m fearful of dearth! If it’s not one varmint it’s another. I no sooner got the grasshoppers under control than some rodent ate my peaches, and now this! 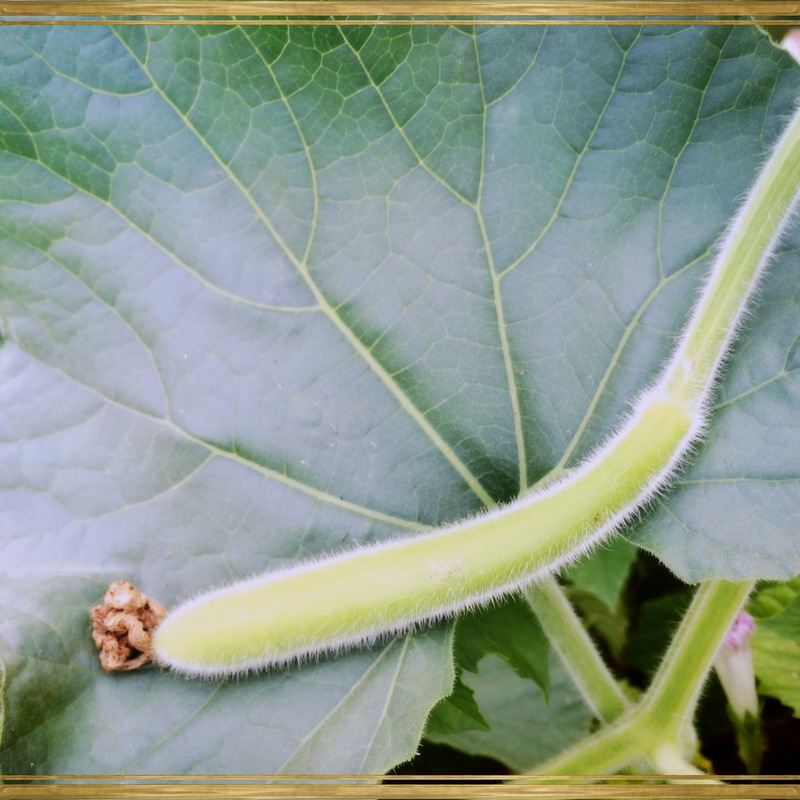 A baby snake gourd. Let’s hope this one gets the chance to grow up. 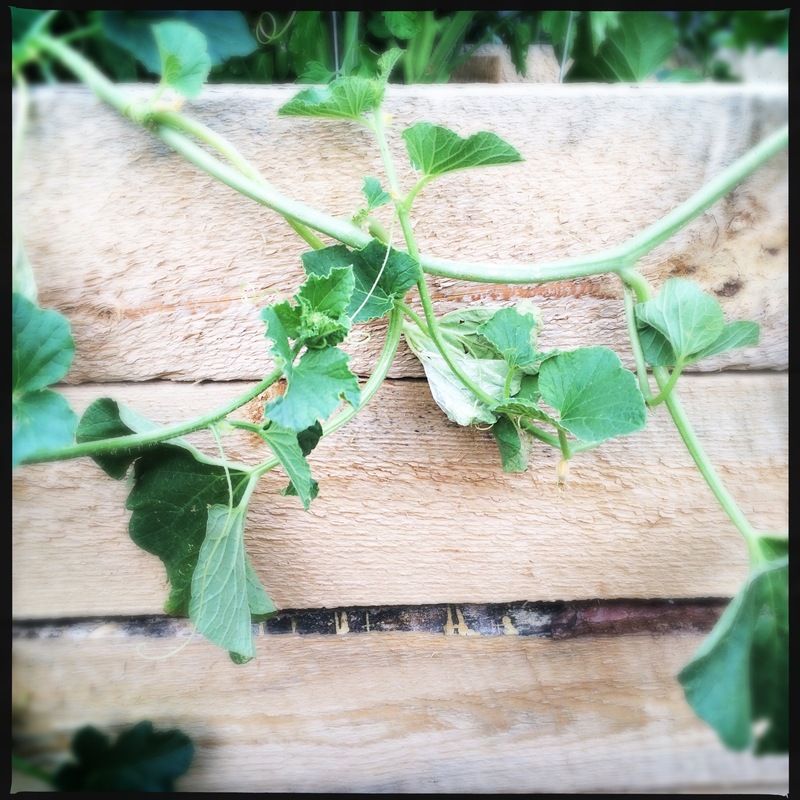 I’ve long suspected the grasshoppers were eating the tiny baby melons, but maybe it’s been rodents all along. 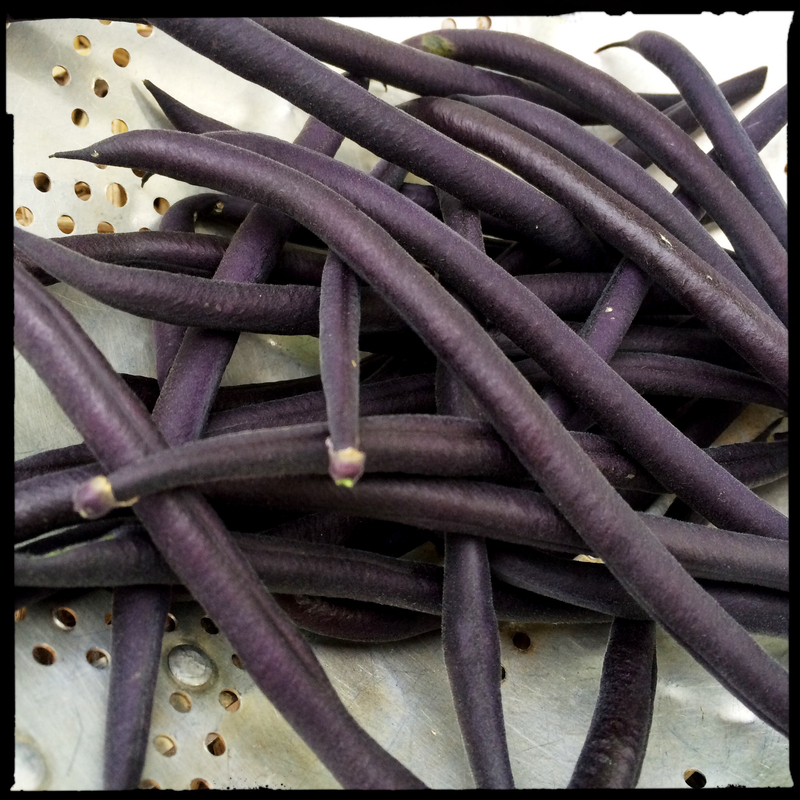 Purple velour filet beans abundant and ripe, with the monster snake gourd resting on the edge behind them. 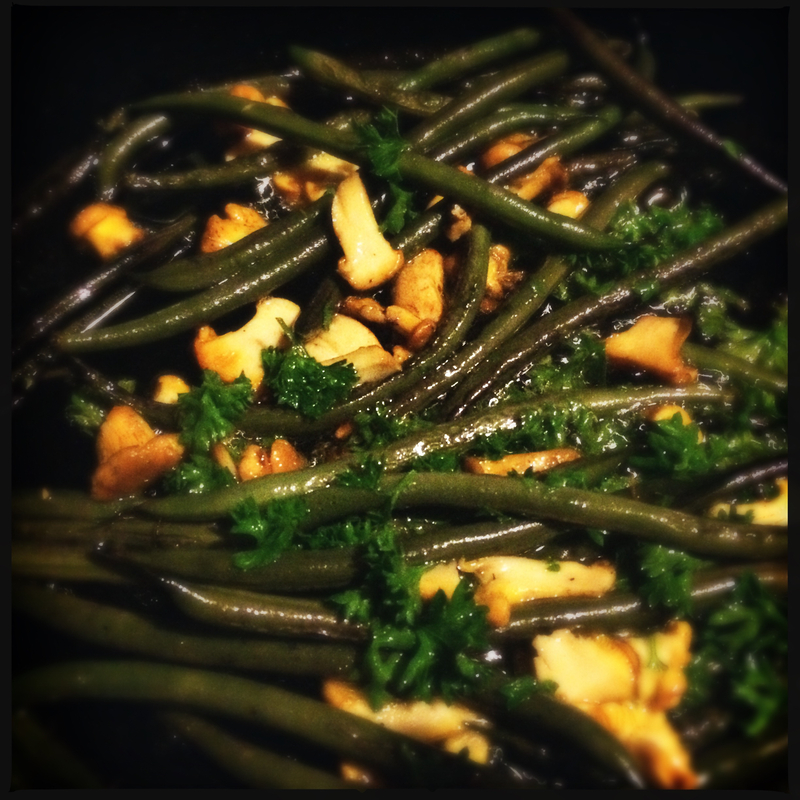 … and sautéed with chanterelles that Gabrielle brought from the forest. Yum. Deb, I saved you some in the freezer. 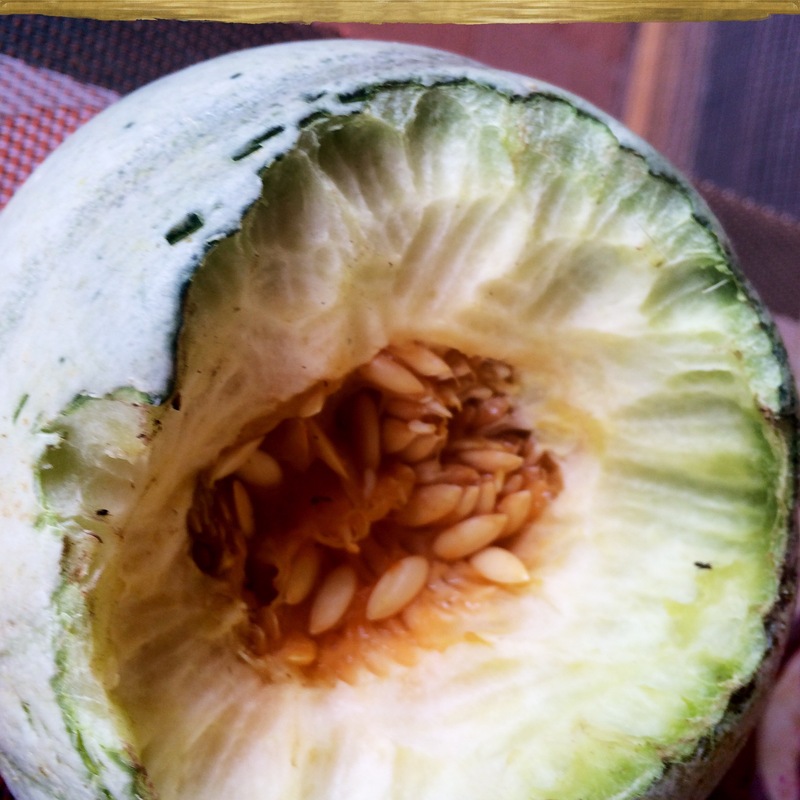 Seriously, can anyone tell me what critter left these tooth marks in the melon? Oh well. I don’t mind what happens.